So you're thinking its nice, comfortable and smells good in a greenhouse. It's hundreds of happy plants and a bit humid. Don't start thinking that the greenhouse effect for Earth would make such a nice place. It's a term that scientists use to describe a slow increase in atmospheric temperature. That increase could be natural or accelerated by humans. It's not always bad, but it does bring change. As with everything on Earth, there are cycles. Cold periods changing to warmer periods just happen in nature. For our discussion, the current greenhouse effect is changing the world we live in and it might not lead to happy plant times. As we mentioned, many things cause the greenhouse effect in our atmosphere. Our story starts with energy from the Sun. High energy radiation hits the Earth and the shorter (more energetic) wavelength energy makes it to the surface. As all of that electromagnetic radiation hits the surface, the land and water heat up. When something heats up, it means they are releasing long wavelength radiation (infrared). When that new form of energy is radiated, it all doesn't leave the Earth. Most of it bounces around our atmosphere. The result is an increase in the atmospheric temperature. Water vapor also plays a part in trapping that reflected heat energy. More water vapor in the atmosphere allows for more absorption. With that said, think about the larger picture of the planet. As water vapor levels increase, the temperature rises. As the temperature rises, the polar ice caps begin to melt. A portion of that additional water moves to the atmosphere and allows for more absorption. The higher temperatures also lead to more extreme weather including winter storms and tropical cyclones. All of that natural absorption, radiation, and reflection is supposed to happen. Without it, the temperature of our atmosphere would be much lower and life would have a harder time surviving. But lately, that temperature has begun to increase. and only part of it is natural. As with everything on our planet, we affect the environment. Related to the greenhouse effect, we are releasing many chemical compounds into the atmosphere that trap that longer wavelength energy (heat). When it is trapped and reflected back, the temperature increases. Fossil fuels are the easy culprit. All of our cars and power plants are spitting out emissions that spread through the atmosphere changing the way the Earth works. There are also many pollutants that are released into the air. It doesn't happen as much in developed countries because of laws that are in place. Developing nations across the world need to generate income, so they often don't think about the pollution. The problem is that the atmosphere of the world is shared and all of their pollution becomes our pollution after a few weeks. Chemical compounds such as carbon dioxide, methane, and ozone are big players in the greenhouse effect. Astronomers studying our solar system believe that many other planets show signs of the greenhouse effect. 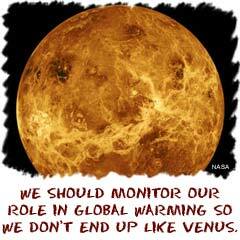 Planets such as Venus have many gases in the atmosphere that permanently trap energy received from the Sun, further increasing their temperatures. If it can happen in our solar system, there is also reason to believe we will discover planets in other systems that show the same activity.